Composed by Lao Zi in 550 B.C. It was his understanding of the hidden wisdom inherent in I-Ching, The Book of Changes. In layman's terms (Lao Zi's time, i.e. 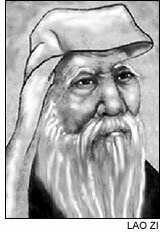 2500 years ago) he presented "The Way", Dao, of which "Men" should behave, act and live, and "The Virtue (Merits)", De, of which "men" would collect, adopt and nurture. With a total of 5,000 (Chinese) characters, Lao Zi described, portrayed and manifested the "Wisdom" into 81 chapters. In the subsequent centuries, Daoist religion gradually evolved from Lao Zi's philiosophy and eventually presented itself in it's contemporary format. Prerequisite: post-secondary education (in English language). Our course begins with a general overview of the philosophies in this book. Selected chapters will be studied and discussed in detail. Students are encouraged to explore, probe the chapters, the lines and the words on their own with the methodologies of their choice. Group discussion and debates are the main theme of this course.